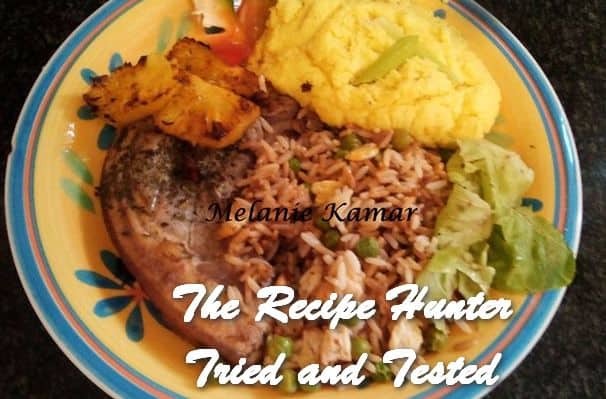 Mix everything in a bowl including pineapple ensuring that pork chops are well coated. Refrigerate for an hour. Preheat oven to 180 degrees and bake chops for 30 minutes turning and basting halfway. Grill pineapple in cast iron griddle pan till charred, alternatively, place on top of chops in the oven the last 10-15 minutes. Add ½ TB oil to wok. Add peas and carrot with pinch of salt. Add cooked ham (chicken, beef, pork or shrimp). Add cooked rice stir one minute and remove. Add bean sprouts and stir one minute and remove. Add egg, draw toward you with spatula then mix through. Push to sides – add rice and sprouts and mix egg through. Add salt, soya sauce and sesame oil and mix through. Cut potatoes in quarters. Add to pot of cold water and add stock cube and turmeric. Boil until tender. Drain and return to same pot. With potato masher, mash potatoes until most lumps gone. Add the soup power, salt, pepper, butter and half the milk. Using an electric hand mixer mix the mashed potatoes gradually pouring enough milk till you get a smooth texture.